You invited your closest friends, your co-workers and family and none of them want to leave because they are having the time of their lives! They just can’t stop dancing, laughing and singing! The next day, your boss gives you a raise, and that special someone that you met at the party asks you for a date! You knocked it out of the park! And it all started with using the best equipment available! The best part about it was that you didn’t have to worry about how easy it was to set up. That’s because you just plugged it in and you were ready to go! This is me, Johnny Only, holding the exact headphones that you will be getting from us. We use top of the line headphones that each have three user selectable channels and their own user adjustable volume control. 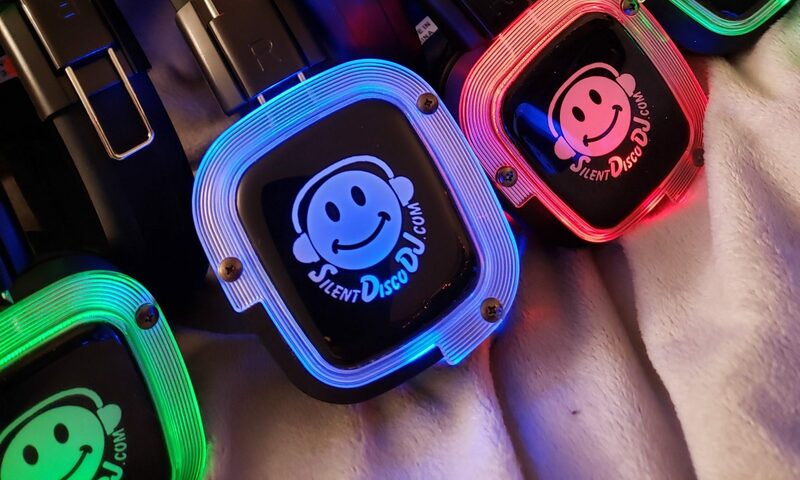 Our headphones light up by color according to which channel they are on. They are the three channel, battery powered (10 hours of operation), FM wireless, and they light up according to which channel you select. They each have their own volume control so you decide how loud you want to party! Watch the video below to see the controls, colors and construction of the headphones. We deliver the headphones to you fully charged. They will operate for about 10 hours depending on how loud they are set, so most of our clients don’t have to re-charge them. But just in case you do, here is how you do it. I include connectors so you can play your music with smartphones, ipods, ipads, tablests, computers and mixer boards. Note: If you are using a phone, tablet or computer, always run your device volume all the way up because that affects the volume level in the headphones. If you have the volume too low on your phone, tablet or computer, then your guests won’t be able to turn up the music in their headphones. Mixer boards have higher output levels than the devices above, so don’t do that with mixer boards. You still want to run them relatively high, but obviously not so high that they start clipping or distorting. Check out this linked blog post for even more information than what is above about the equipment.